We begin with a splash page of Crystal wearing a blue FF uniform, rather than usual yellow costume. She says now that Sue is home with the baby, someone has to take her place on the team. Then we get this issue’s variation of the “excuse for the character to show off their powers in the first few pages” thing, except this time it’s Crystal showing off her powers. Nonetheless, her power set remains frustratingly ambiguous. She throws Ben and Johnny around the room with a gust of wind, saying she can “harness natural forces” and bend them to her will. Reed shows up, reports that Sue and the baby are doing well (we still don’t know the baby’s name at this point) and he questions Crystal about the costume. He says she’s too young to join the team, but she says she’s the same age Sue was when the team was formed. This “passage of time” moment is interesting, in that it reveals that the characters have been doing this for years, something that doesn’t quite come across when reading issues in bulk, but did when you picked them up only once a month. Then we visit the Wizard, in his hideout, where he has built another pair of super-powered gloves, which he says will give him the combined powers of the Fantastic Four. He’s downright obsessed with the FF, going on and on about how he wants to defeat them. Inside Reed’s lab, the Wizard’s old gloves, which the team confiscated in issue #78, disappear in an “electro-wave.” Reed knows this is the Wizard trying to bait our heroes into a trap, but Johnny doesn’t listen. He takes off, flying around New York, looking for a fight. 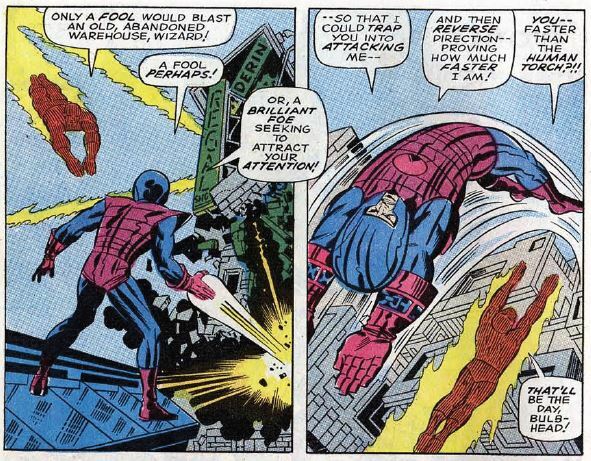 He finds the Wizard destroying an abandoned warehouse (Oh, Marvel’s New York, you and your abandoned warehouses). They fight, and the Wizard shows that he’s now faster than Johnny, and he has the strength to tear off a church steeple and throw it at him. Johnny destroys the steeple with a “bullseye heat blast” and worries that the Wizard has become too powerful. Reed, Ben and Crystal head to the scene in the Fantasticar. Ben makes a wisecrack about Johnny, but Crystal is so serious she can’t tell Ben is only kidding. They meet up with Johnny and… fighting! The Wizard throws a water tower at our heroes, but Ben wallops it and Crystal deduces that it will fall harmlessly into the nearby river. The Wizard attacks again, but Crystal uses her “elemental force” on his anti-grav devices, sending him flying all over the city. He recovers and sends shock waves after her, which she stops by creating counter-shock waves. She then unleashes lightning bolts down onto him and fills his lungs with smoke. Johnny wraps up the Wizard is a fire lasso and Ben throws a piece of debris at the bad guy. The Wizard falls under the water, knows he’s been defeated, and flees. Instead of pursuing the villain, Reed just does a “We haven’t seen the last of him!” He then apologizes to Crystal, and welcomes her as a full-fledged member of the team. Unstable molecule: Aside from piloting the Fantasticar, Reed does nothing during the fight. I guess he’s being cautious now that he’s got a kid at home. Fantastic fifth wheel: Crystal is the team’s first alternate member, setting the precedent for all kinds of “fill-in” guest heroes in the future. She reveals that she’s Medusa’s younger sister, which explains her role in the Inhumans’ royal family. Clobberin’ time: When Crystal confronts Ben about making fun of Johnny, Ben comes clean and admits that he’s really the Torch’s biggest fan. Flame on: Johnny is awfully eager to fight the Wizard. Remember, though, that the Wizard was Johnny’s arch-nemesis during his solo stories in Strange Tales, so there’s a lot of history there. Commercial break: Clean AND fuzzy? Trivia time: This issue contains an announcement that Marvel won big at the Society for Comic Art Research and Preservation Awards. Fantastic Four won Best Adventure Comic (Group) and Best Super-powered Group. 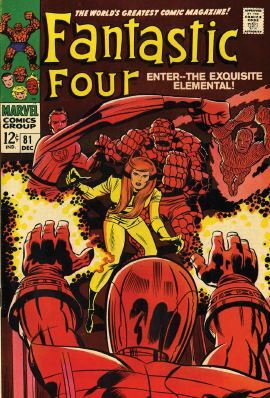 Stan Lee won Best Writer and Best Editor, Jack Kirby won Best Pencil Artist, Joe Sinnott won Best Inker, and Dr. Doom won Best Villain with more than 50 percent of the vote. Way to go, FF! Fantastic or frightful? The Wizard in this issue is just a generic villain, somebody who’s here just so the heroes have someone to fight. Similarly, the regular FF heroes are made to look weak and uncoordinated, only so Crystal can look awesome by comparison. The good news is that Crystal is pretty awesome. 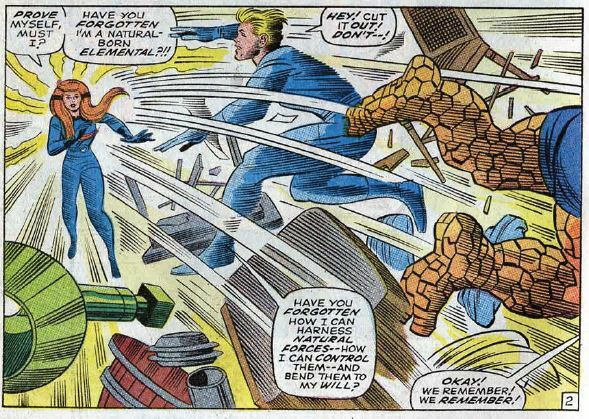 Her powers are still vaguely defined, but her steel intensity during the fight makes her a good balance against Johnny and Ben’s humor. Welcome to the team, girlfriend.